As I set out for the 450 km drive in my Scorp from my adopted city of Mangalore to my birth city of Cochin, excitement and joy filled my heart. For, this trip was going to finally let me experience the magic of North Kerala; something I had been looking forward to for long. 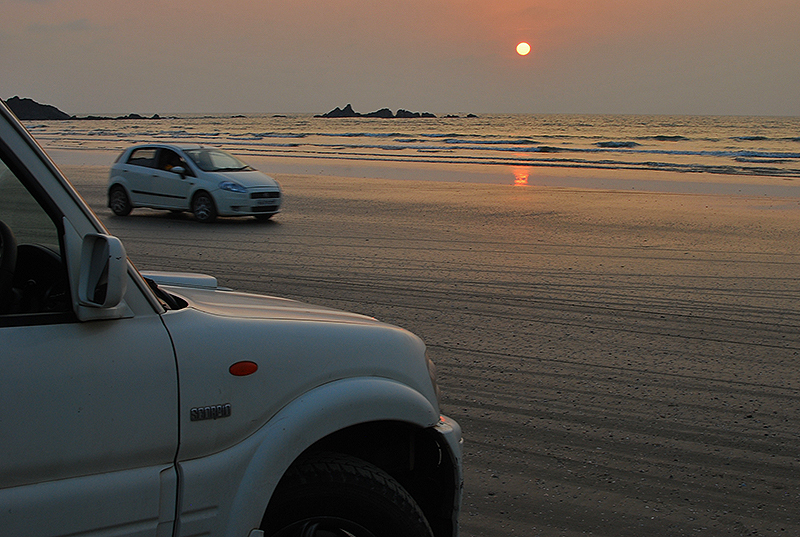 I had been doing these Mangalore-Cochin drives at least once every year for the past few years. Every time I pass through the small towns and villages of North Kerala, I think I should stop to soak in the beauty of these places. But never have I done so for want of getting to Cochin before nightfall. The drive to the center of Kerala usually takes me 10-12 hours (with food breaks), depending on the condition of the roads and the number of times I got lost. In spite of driving through this route 10-12 times before, I still get lost and ‘discover’ newer, longer ways to get to Cochin from Mangalore. Though I don’t mind the extra time it adds to our trips, my co-passengers (my wife and son) usually grumble about this as they tumble out of the car in Cochin. I understand – a geographically challenged person, who loves to drive, in charge of the wheel can be quite frustrating to co-passengers. Narrow highway that, at times, take you through densely populated residential areas or markets, where the speed of traffic could be determined by a slow, gyrating stroll of a cow or a cyclist leading the traffic. Privately run buses (a.k.a private buses) that suddenly appear behind your car with a loud, irritating honk that makes you jump out of your skin, causing you to swerve off road (Remember that introduction scene of the shark in ‘Finding Nemo’ movie? These buses remind me of the shark). Protest rallies blocking the way. Yes, we Keralites are very revolting. Ever-continuing road repairs and over bridge constructions causing diversions. But, for me, this drive is always a pleasure, partly because of the anticipation of meeting my family in Cochin and partly because I just love to drive. The backwaters, the blue tarpaulins over anything that need to be protected from rains, the bridges, the buzz of people engaged in their daily lives are all characteristic sights you will get to see along the way. The heavy influence of Arabic cuisine in Kerala of late can also be felt by the sheer number of restaurants serving Arabic delicacies. The other big change that can be felt just by visiting restaurants is the increase in immigrant population from Orissa, Bengal and some northern/ north eastern parts of India. Most of them work in restaurants as waiters and cooks, cooking and selling true blue Malayalee dishes. My most favorite stretch along this route is the short one from Mahe (a Union territory part of Pondicherry/ an erstwhile French colony) to Thalassery. Mahe is lined with liquor shops and petrol pumps (gas stations) and people stop here to refuel their cars and bodies. Kerala is a state of tea drinkers, and this is very evident when you drive through the highway. You will find a tea shop (sometimes a cart or makeshift building) every 400 meters along the way with an apparatus unique to Kerala for making tea. When it comes to food, North Kerala is famous for its snacks, shell fish preparations, Biriyani, and… for anything and everything they cook. 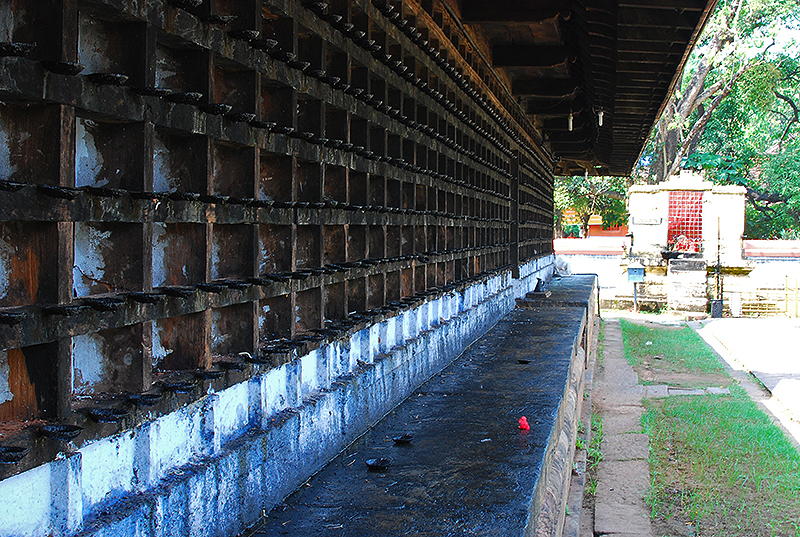 North Kerala also drips in history and culture, like ghee dripping out of Sri Krishna Sweets’ Mysurpas. I have grown up listening to stories about heroes of Kadathanad and Thacholi – the gladiators of Kerala. (If you are a history buff, look up Vadakkanpattu – the ballads that celebrate the valour and skills of the renowned characters). So I had to include Lokanar Kavu (legendery hero Thacholi Othenan was a devotee of this Godess) in my trip to really feel it firsthand. I had already visited a few ‘must-visit’ places in North Kerala – like Bekal Fort, Ananthapura lake temple, and had also been to a couple of resorts – Oyster opera and Nalanda resorts. So I did not want to include them in this trip. I also did not want to do beaches since Mangalore has tons of them, unless it was unique in some way. So I created a route plan based on my preferences and the time I had on hand. My first stop was Kavvayi in Payyanur. You will not find Payyanur listed anywhere as a tourist spot, but there was one article I found, which convinced me that I should check it out. 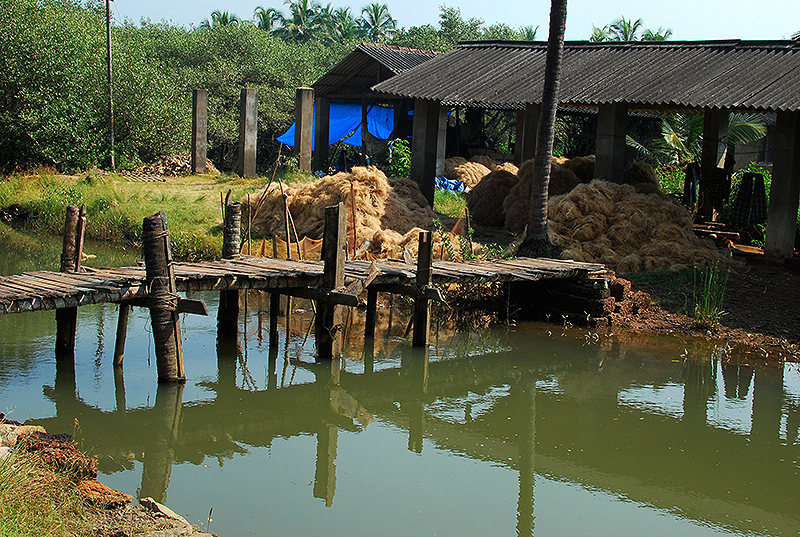 Here’s the article: http://wanderingtastebuds.com/2013/01/18/payyanur-kerala/. Inside Payyanur, when I stopped and asked a local guy for directions to Kavvayi, he seemed amused. 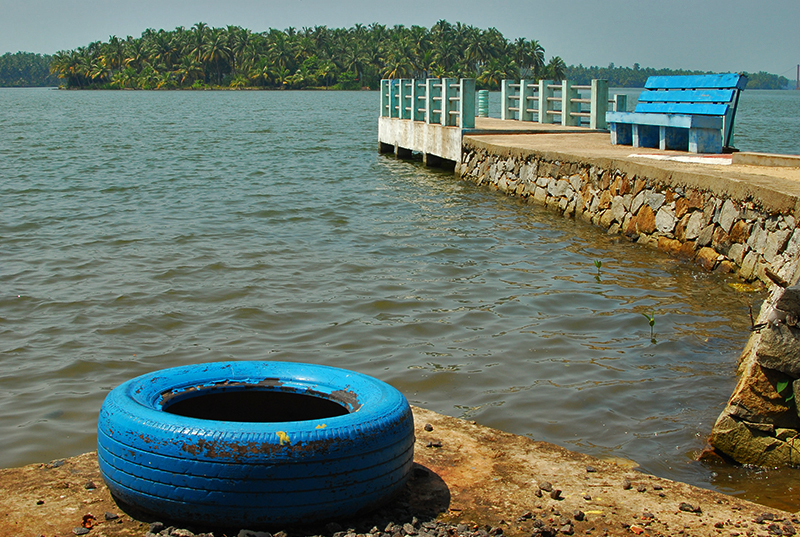 “What is there to see in Kavvayi”, he said, “If you want to see a good place, visit Ettikulam beach”. Assuring him that we will consider his recommendation, we moved on. After a while, the road ended in Kavvayi backwaters. Kavvayi is surrounded by small islands (Valiyaparamba being the biggest among them) which directly face the Arabian Sea. 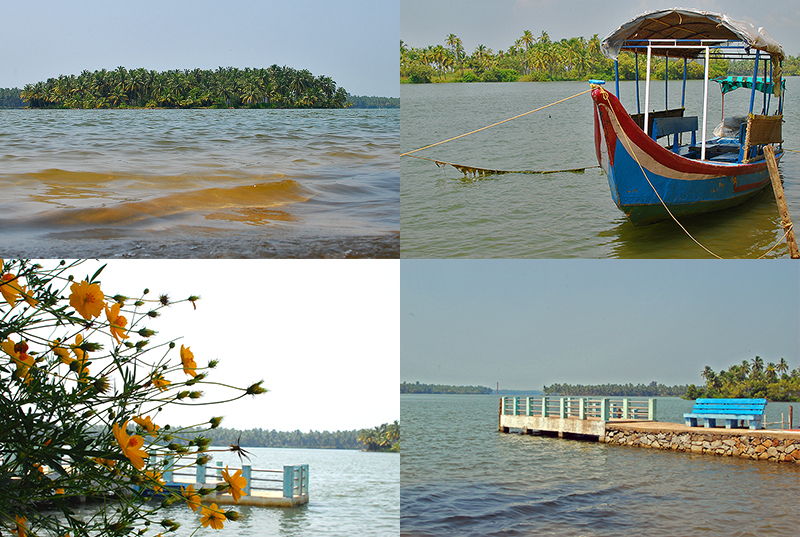 Kavvayi and the cluster of islands around are worth a visit to chill out. State run boats can take you across the islands, but while we were waiting there, I saw some of the local fishermen ferrying passengers across in motor attached thonis as well. At a distance, I could see a hanging bridge (a skinnier version of Golden Gate Bridge) and asked the local boat man if he could take us there. He said the bridge was damaged and not usable. Disappointed, I hung around for some more time listening to the waves hitting the shores, and got back into the car. It was lunch time, and since I had read about Bamboo Fresh in the article I mentioned earlier, I decided to give it a try. It was indeed a great choice. We ordered Karimeen pollichathu, squid fry and meals. The food was fresh and yummy. Satisfied, we continued our drive to Kannur. 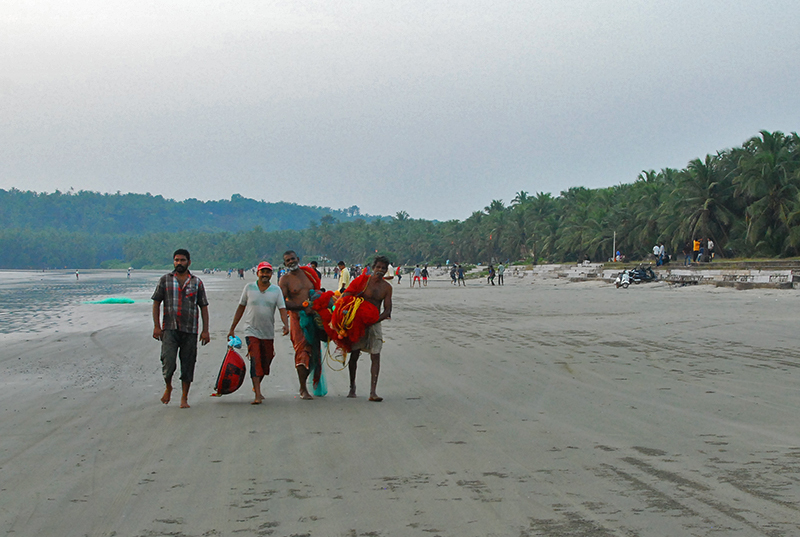 Touted as Kerala’s only drive-in beach, I wanted to see for myself whether Muzhappilangad beach lives up to this claim. After paying an entry fee, I drove straight onto the beach. I could hear the sound of sea shells snapping under my Scorp’s tyres. My initial fears of getting stuck in loose sand soon disappeared as I saw how firm the beach surface was, and I drove the 4 odd km stretch of the beach making giant splashes as waves met my car’s tyres. It was an exhilarating experience to say the least. I hung around till the Sun went down, and this provided me another great spectacle of silhouettes of black jagged rocks sticking out of water, with an orange sky in the background. 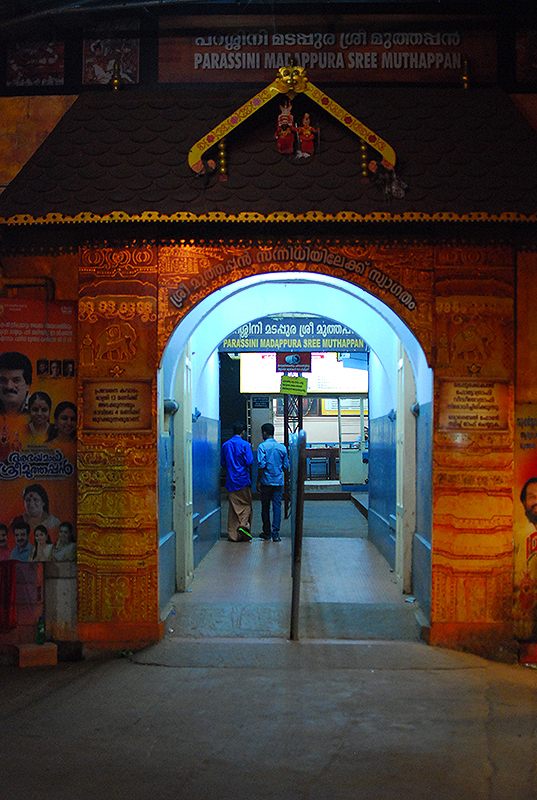 Our next stop was the famous Parassinikkadavu Muthappan temple, situated on the banks of Valapatnam River. 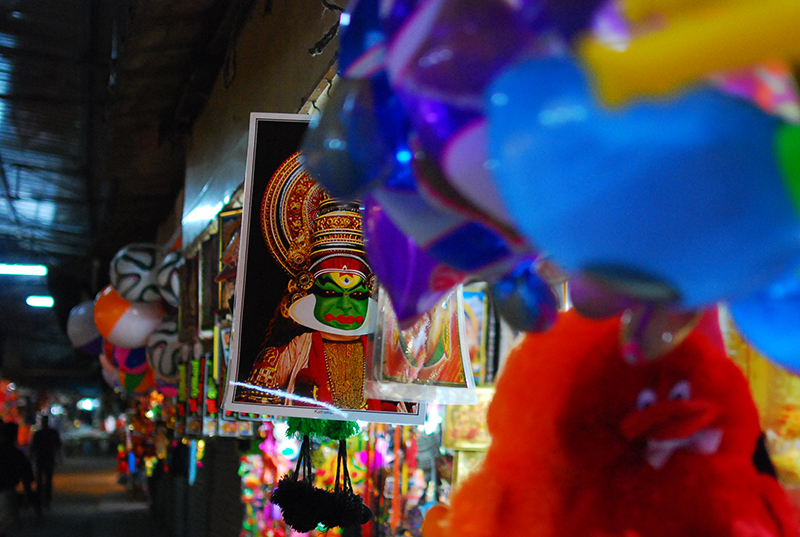 Sree Muthappan is the personification of two divine figures – Thiruvappana (Lord Vishnu) and Vellatom (Lord Shiva). Here dogs are considered sacred and can be seen in large numbers around the temple. I had heard that unlike other temples, this temple gave fish and chicken as prasadam – and this is what I wanted to see. I got to know from locals that every evening (6.30 pm – 9 pm) and morning, they perform Theyyam (an artist who assumes ‘divinity’ by representing the God – with men adorning masks and costumes with a riot of colours). Unfortunately, the day we visited the temple, this was not on because a death had taken place in the family maintaining the temple. All devotees were offered boiled beans and tea, and I could also see people queing up for dinner provided by the temple. Outside the temple was a line of shops selling knick-knacks. 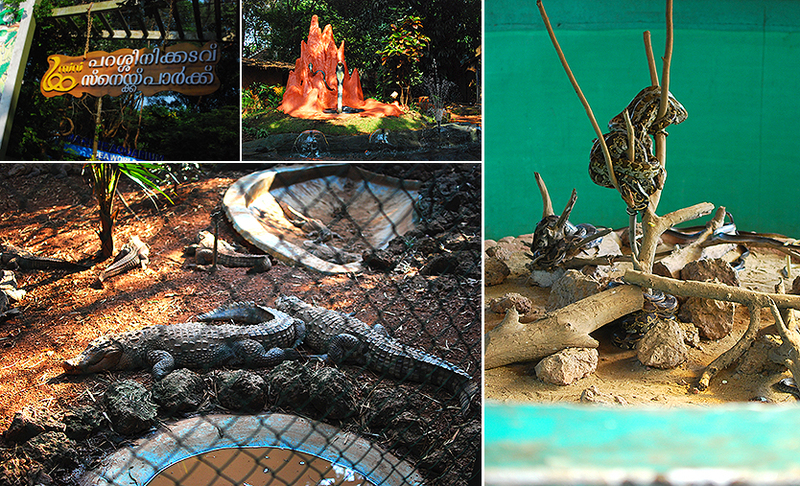 On the way to the temple, we’d noticed Parassinkkadavu Snake Park, and had gone in to kill some time. The park houses a variety of snakes and other small animals, and there was a very neatly done snacks bar from where we had some great boosters. The drink I ordered – cucumber/nannari/lime/honey – really did pep up my spirits. Cleartrip had got me a great deal for my room reservation at the famous Mascot hotel in Kannur. That was a last minute booking I did, thanks to the recommendation from a friend of mine, and boy, was I glad I did that. 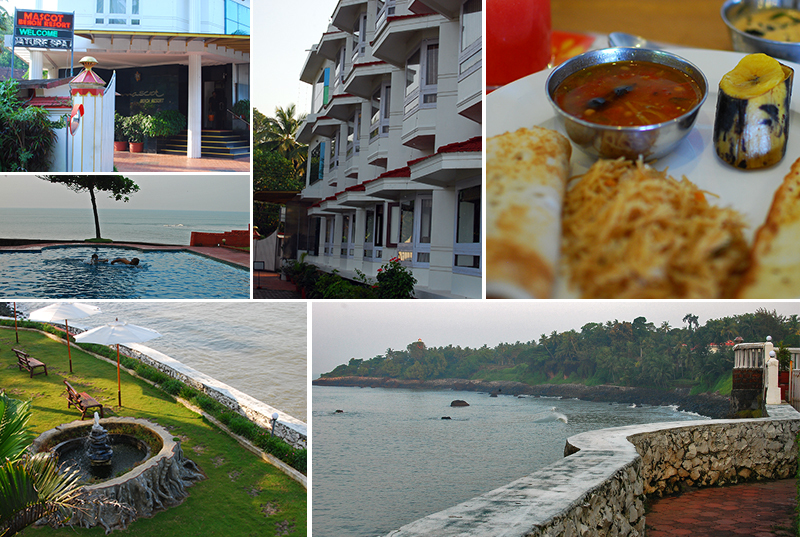 This beautiful resort is located near the Kannur Cantonment on a cliff facing the Great Arabian Sea. For dinner, I thought we would try out a restaurant that my friend had recommended – Odhens (also called Ondens?). I located the place with help from Google maps, but on reaching there, learned that Odhens only serves lunch. So we went back to Mascot and had a candle light dinner, which was fun. 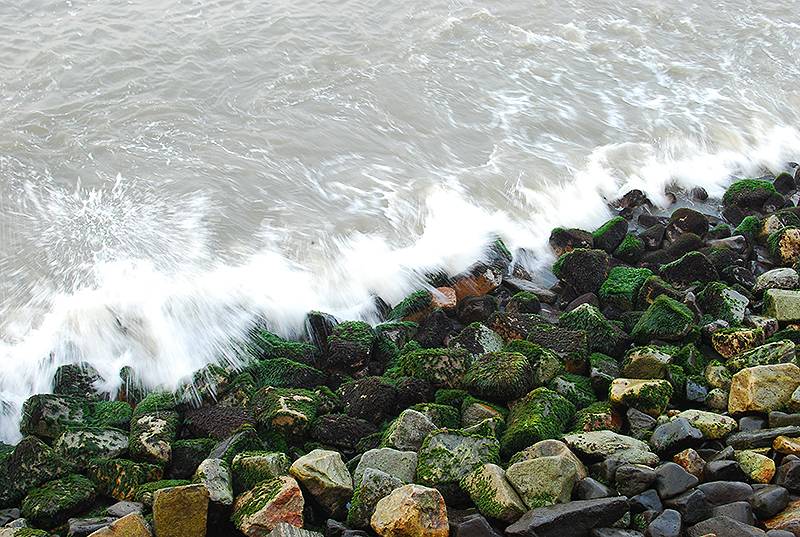 Later that night, we slept to the sounds of waves crashing against rocks all night. After a morning swim (in a pool overlooking the sea), we were treated to a sumptuous complimentary breakfast. With our stomachs full, we dragged ourselves into the car again. 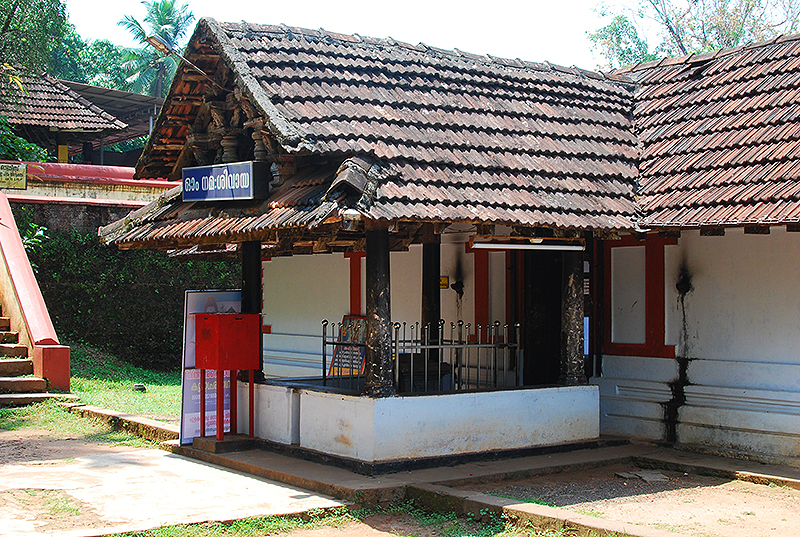 Lokanarkavu temple is renowned for its historical significance, because Thacholi Othenan, the renowned martial hero of Kerala, used to come to the temple every day and worship its presiding deity i.e. Goddess Durga. The temple gave me a very positive vibe, and I felt at peace as soon as I entered it. I was a bit disaoppointed that there weren’t any write-ups or displays/ museums detailing the history of this place. 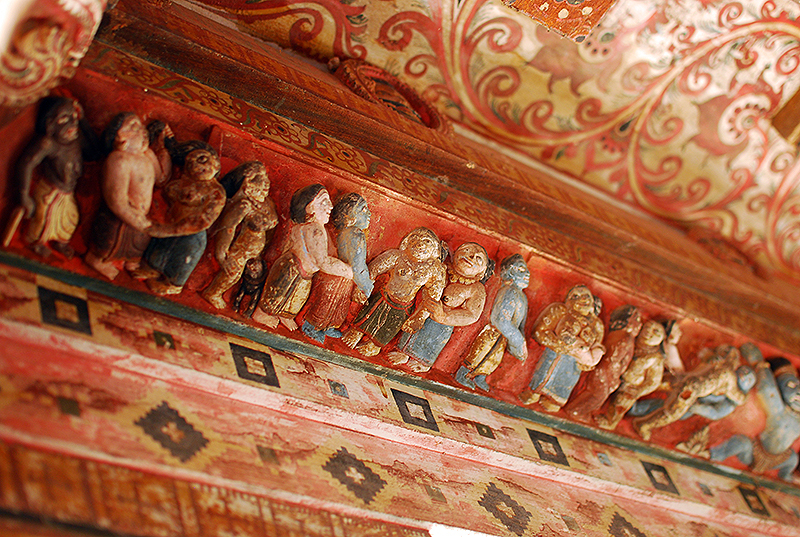 The temple looked its age, and the ceilings had carvings depicting (I presume) the lives of people of that day and age. 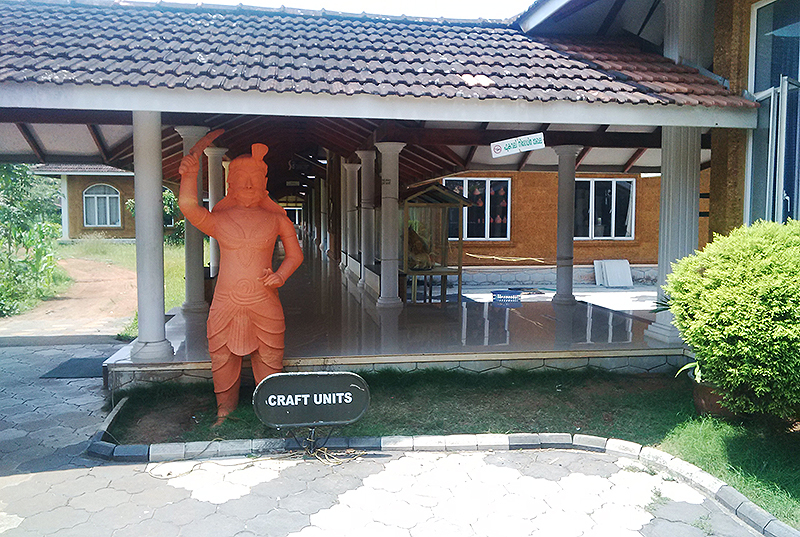 Located in Iringal (a pretty little village near Vadakara, renowned resistance of Kunjali Marakkar), Sargaalaya, the Kerala Arts and Crafts village is an initiative of the Department of Tourism, Government of Kerala. Since they asked for a whopping Rs 100 for taking my camera in, I decided not to. Call me a scrooge, but I didn’t think it was worth it. Plus, as I later found out, they had ‘No photography’ board put up in most of the stalls. So, paying Rs 100 to take in your camera and not being able to click any pictures would have be plain stupid, don’t you think? That apart, this is a place you must visit to see the traditional artisans in action and pick up some great quality souvenirs. Most of my love went to the bamboo crafts and the murals. 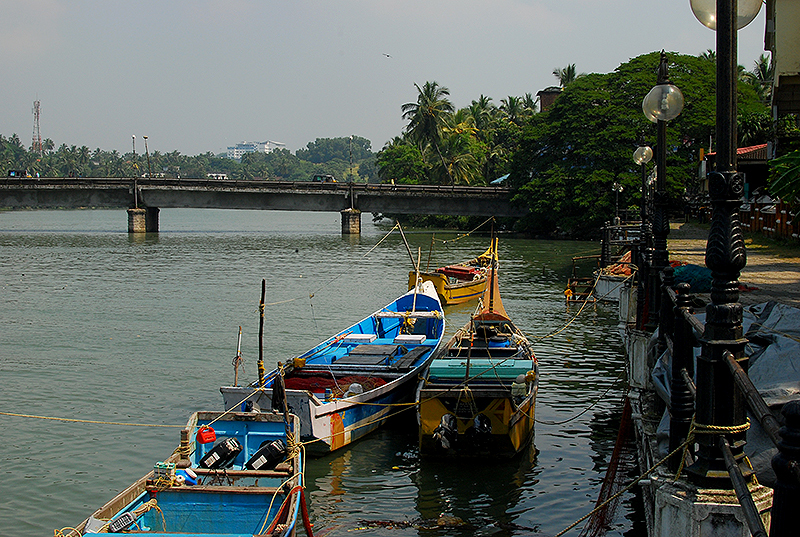 After this stop, we drove through my favourite stretch of Mahe and Thalassery, stopping for a stroll through the Mahe riverside walkway. I know I haven’t even skimmed the surface of what could be experienced in North Kerala. To really get drenched in the culture, food and history of these renowned places, one would need to spend days slow-traveling probably on a bicycle. Maybe I will do this someday. But for now, it was time to double up to Cochin, where my family would be waiting. How much money would one need to experience Kerala like a king (or queen)? But you will have to fight like a king/queen to win one. I am talking about Kerala Tourism’s recently launched contest – Visit Kerala Bid Wars. This is a contest where the lowest bidder wins a dream vacation to Kerala. One warrior got a dream vacation worth Rs 13,600 for just Rs 63! Another one won a Rs 10,862 Kerala holiday for just Rs 35! Visit @KeralaTourism on Twitter to read about more such warriors. Sounds too good to be true, right? After all, when it comes to the digital world, anything that sounds too good to be true probably isn’t, right? So I decided to get to the bottom of this – I asked one of my friends at Kerala Tourism what this hullabaloo was all about, and whether all this was authentic. Here are the details (as provided by Kerala Tourism): Kerala Tourism has launched an online bidding game offering holiday packages to the state at virtually no cost. 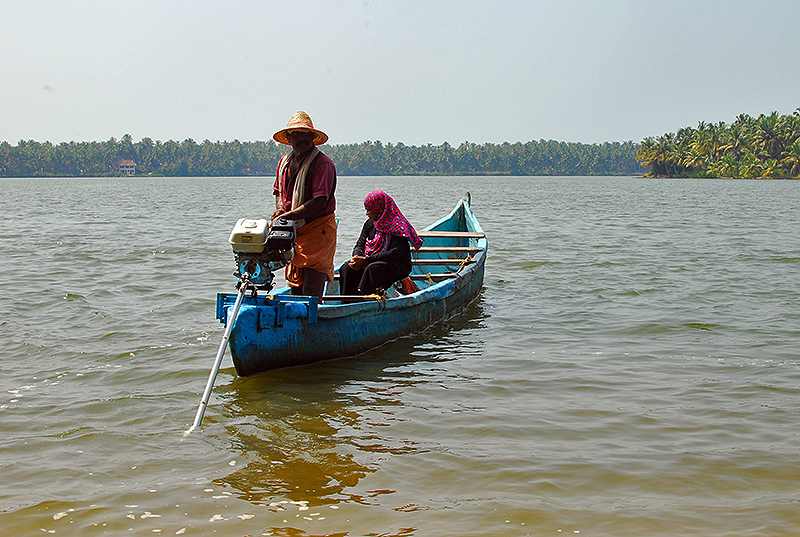 The bid, aimed at domestic travellers, is organised as part of the ‘Visit Kerala 2015’ campaign. 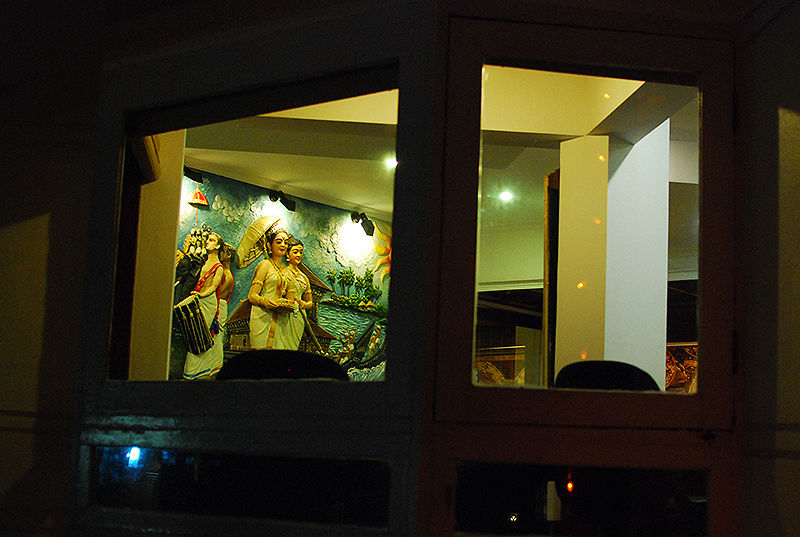 Tour packages provided by accredited service providers of Kerala Tourism will be uploaded on a dedicated Facebook app. An Android application is also being developed for Kerala Tourism Facebook fans to bid for packages right from their mobile devices. Facebook fans of Kerala Tourism can bid for the package. For example: A person ‘X’ places his/her bid of Rs. 20 for a vacation package worth Rs. 20,000. The package will be awarded to her/him if no other bid is less than or equal to Rs. 10. Good luck! I hope you win one, and I win one too. BTW, I have managed to get a sword, but how do I tie this dhoti kalaripayattu style? Any tips? Nice write-up. Enjoyed reading this. I have to bookmark this page. For that day when i can make this trip through north kerala.. Thanks, Sudeep. 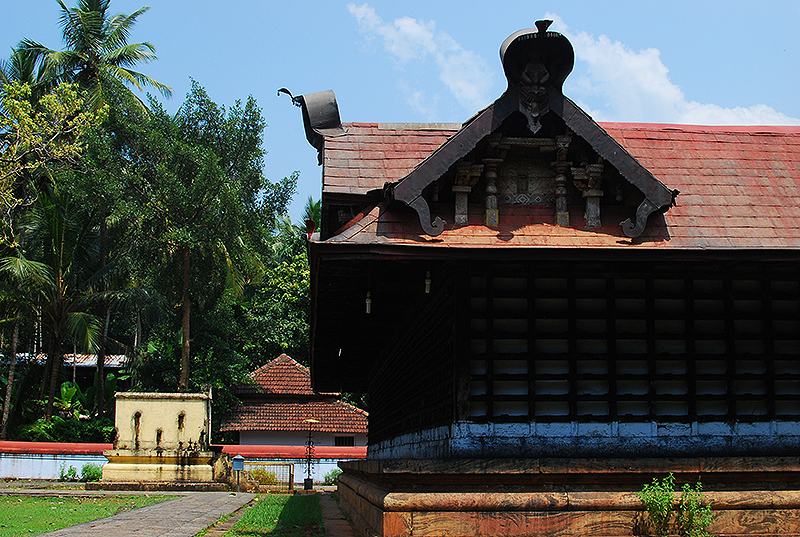 Would love to hear about your trip to North Kerala – here’s wishing that it happens soon.